A modern aesthetic thrives at Waterwheel House Quilt Shop in Londonderry, Vermont, thanks to the keen eye of its skilled caretaker. Waterwheel House Quilt Shop in Londonderry, Vermont, melds old and new. In 2008, shop owner Shelley Sas and her husband, Andrew, bought and renovated a 1790s farmhouse into the quilt shop. Quilted samples—ranging from small bags to full-size quilts—incorporating brights and white present a pleasing juxtaposition to the shop’s rural charm. Andrew and Shelley Sas (owners) and Gracie, the shop dog. Pick Up Sticks, one of Shelley’s original designs, features improvisational piecing. Shelley’s love for sewing budded when she started designing felted wool penny rug projects. At Waterwheel House Quilt Shop, many of the classes use art-inspired techniques, as illustrated by this mixed media wall hanging. 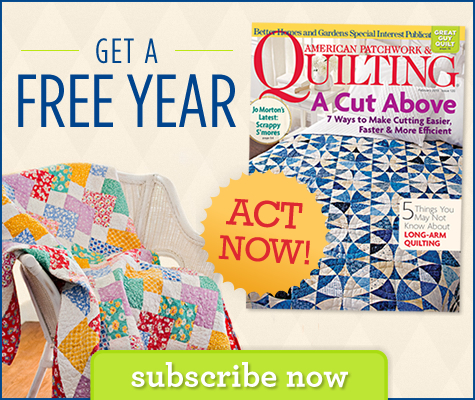 Quilters also can learn sashiko embroidery and paper-piecing techniques. Assembled grab-and-go bundles of fat quarters are a big hit with quilters looking for a starter mix of fabric to use in their next project. Shop co-owner Shelley Sas and shop manager Judith Ackerman designed Stripe It Rich for Quilt Sampler® Fall/Winter 2012 magazine. Shop co-owner Andrew Sas machine-quilted an allover stipple motif across the Courthouse Steps-style throw. Contact Waterwheel House Quilt Shop  to purchase a copy of the Fall/Winter 2012 issue of Quilt Sampler magazine, pick up the magazine at your local quilt shop or newsstand, or get the digital issue online . Peek inside Scottie Dog Quilts , another quilt shop featured in Quilt Sampler Fall/Winter 2012.